In the second half of the 18th century, the baroque flute that many early music followers know well was modified by the addition of closed-standing keys. These keys were at first optional. The flutist could use them when convenient to obtain stronger tones on the notes outside the natural scale of D major, stronger than the 'veiled tones' given by the technique of 'forked fingerings'. But the flutist could also ignore the keys in fast or awkward passages revert to the fingerings of the one-key flute. This type of keyed flute is often heard in period instrument performances of late Mozart and Haydn. Once the flute had acquired keys, it began to evolve in a way that incorporated the keys as an integral part of the system. The mature 19th century wooden, multi-keyed flute is the instrument that is featured in this concert. It retains the conical bore and six open finger holes of the 18th century flute, but has become more even and somewhat louder. While difficult to play, it has a more flexible tone and more 'character' than the modern silver flute. It can be mellow in the low notes while liquid and colorful in the high notes. The flutes to be used in our concert are shown below. The first group (of four flutes) are early 19th century flutes and will be used for Kuhlau. The next group of four late 19th/early 20th century flutes is for Köhler's music. 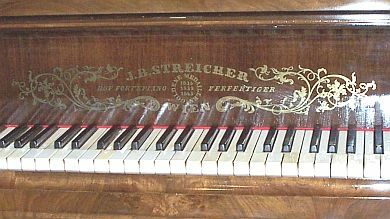 The piano is dated 1857. It was made by by Johann Baptist Streicher, third generation of a piano building family that started with Johann Andreas Stein who passed on the business to daughter Nanette Stein Streicher and then to her son Johann Baptist. This instrument was restored in 1999 by Ed Swenson of Trumansburg, NY (see www.mozartpiano.com). While the Viennese action is original, it has been releathered. The strings are modern reproductions of 19th century piano strings. Brahms owned a Streicher, but one made later than this one, and made an early recording (1889) on a Streicher instrument. We are using a pitch of A=430 in this concert for those pieces with piano, because this is the pitch at which the Streicher piano is and has been maintained since its restoration. It is not so inappropriate for the music. The early 19th century B-foot flutes we use play well at A=435 and can adapt to A=430 without much difficulty. While pitch rose well above A=450 in the middle of the century in many locations, an effort to restore pitch to A=435 (called diapason normal in France) was made at the end of the century; most of the late 19th century flutes that we play were designed for this pitch and are reasonably happy to play at A=430. More on Köhler and Zimmermann flutes.